The Fall were an English post-punk band, formed in 1976 in Prestwich, Greater Manchester. They underwent many line up changes, with vocalist and founder Mark E. Smith as the only constant member. 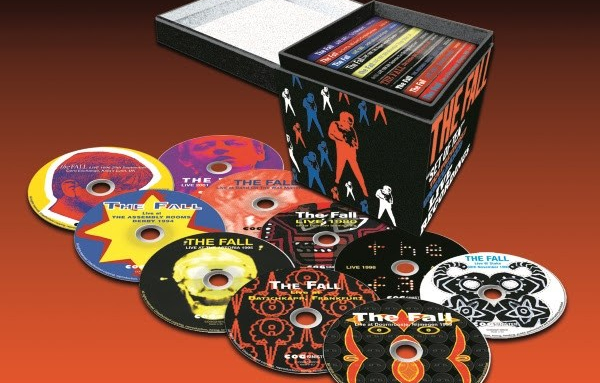 “The Fall Live: Set of Ten Box” featuring 10 previously unreleased live performances in one Box Set is now available for pre-order! No other band in the world can touch The Fall’s magnificence, the sheer volume that’s captured in, “Set of Ten.” (Issued on Cog Sinister, The Fall’s official label), is limited edition (only 500 units) of 10 discs of previously unreleased live recordings, spanning three decades. The earliest recording taken from 1980 and most recent being 2001, including the legendry London, Astoria from 1998 and the ultra rare New Orleans recording from way back in 1981.